Wooden pool loubnger with adjustable settings for head into 3 positions. 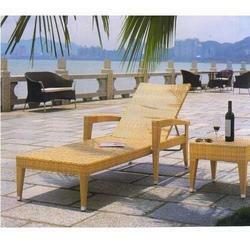 Material: Aluminum Frame and Weaving of Synthetic Wicker. MS framing with approx paint, and wicker wiving all weather proof coating. Deluxe Lounge is available in size of 68" X 33" (173 X 84 cm) and is readily available in classic colors with fashionable logo. One can relax in this comfortable lounger. It has 4 air chambers for extra safety. Usage: Hotel, Patio; Garden etc.